I'm re-posting this today for a reason. More details at the end of the post. I think I lost of few of the valued original comments too and I'm sorry about that... as well as other things. My son was given a goldfish as a birthday present when he was two. He came in a little bowl. The fish, that is, not my son. The fish is still there, much bigger, much older. Back when he arrived, I could only stand to look at him in that little bowl for a few days. It wasn’t good. So I went out and bought him a sizeable tank, an air pump, water filter, stones. My son was too small to look after him so the job fell to me. It is in my nature to take care of everything in my world (except me) so the fishy did all right for himself. He was called ‘Goldie’ back then. The only thing I didn’t get for Goldie’s tank was a lid. I tell a lie. I did get a lid but I didn’t like the aesthetic of it and I figured Goldie might like to see the ceiling so I left it off. Goldie has had a good life, I think. 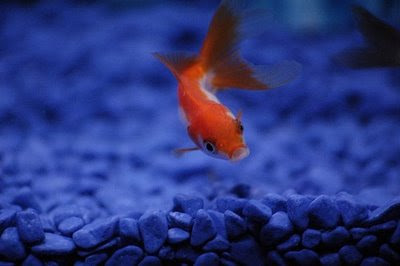 He had other goldfish, for company along the way ,who lasted some years and then faded away. He has mated in his tank and produced offspring. He had a Plecostomus in there for a while too but that really didn’t work out – another story. One morning, some years ago, I went into the kitchen, pottered around in a muddy pre-work fashion, and suddenly missed the occasional peripheral flash from the tank. I looked in. Goldie was not there. He was, in fact, on the hard-tiled floor, several metres from the tank. I bent to examine him. He was unmoving and his tail was bent upwards at the rear. I pinched his tail between thumb and forefinger and peeled him off the floor. All the scales on the ‘floor-side’ were left stuck to the tiles. He was stiff and he was cold. I headed sadly for the bin. It is a surprising fact that goldfish will jump dramatically from their tank from time to time. Perhaps the nutrient level in the water had risen to an inhospitable level – whatever the reason, Goldie had bailed out and there had been no lid to stop her. (Incidentally, ‘she’ became feminine after ‘she’ jumped out, read what you will into that). So there I was - poised over the bin. What would my son say when he heard I had killed his fish? Better, I reasoned, to show him the lifeless body rather than just tell him about it. There was a bucket of water in the utility which I kept for topping up the tank. I plopped the fish into it and went to get ready for work. For weeks Goldie was a Zombie-Corpse-Fish, tattered and torn, weak and ugly. But ‘She’ gradually strengthened back into a ‘He’. And ‘He’ survived. Within a surprisingly-short period of time, the scales all grew back, the jaunty gait returned. So these days ‘Goldie’ is known to us as ‘Lazarus’. I would never in my life have bought a goldfish for myself but this little creature has rewarded me plenty for the small bit of care I have dished out over the years. Sometimes when I come home stressed or fed-up, I’ll sit and watch the little fella swim - so beautifully-formed against the artificially-induced current that swirls around within the tank. And, when I finally rise to go, I often find that my sitting has done me some modicum of good. So here’s to the next ten years Goldie… I mean Lazarus. 13th March 2009: Eleven years and three hundred and sixty four days since he came into our home as an unwelcome present for our (then) two year old, the aforementioned fish died gently. Don't be sad, he had a good life and gave much pleasure in return. Even the original Lazarus had to die again sometime. Sorry to hear that this time Lazarus has truly passed on. Goldfish are remarkably durable. :) I "inherited" one named Bubbles from the little boy across the street when his military family moved. I think the little boy believed it was an engagement present, as he swore to return and marry me. We were 8 [Bubbles was about 4]. I'd helped clean the fish bowl before and learned an important fact: Bubbles would thrash about if you came at him with a net, but if you put your hand in the water, he would swim into your palm and allow himself to be placed in temporary quarters while you cleaned his house. A few months later, Dad bought another goldfish, which we immediately named "Trouble". Why? Because he CONSTANTLY jumped out of the bowl! Every morning, the first kid up would check the counter for Trouble, scoop him up and drop him back into the bowl. Bubbles lasted for almost 10 years. As for Trouble...well one day we didn't rise early enough and he had no Lazarus in him. Interesting...I referred to both our fish as "He" and I don't have a clue what either was...except fun. May His soul res in peace. I was thinking do fish have souls? I'm sure his life had been worthwhile for he had been a source of joy to you and your family. As they say, it is not the length of our lives that matters , it is how we lived it. lol. Cheers and happy blog hopping. D'ya think you'll get another fish? Ken who brings fish back from the dead! And how shall we worship thee oh lord? Hope: My hairdresser in London (I wish I could say he was a barber but he just wouldn't)showed me his two fish tanks at his house where I used to go for haircuts. He claimed he separated his two fishes into different tanks after they were quarreling but he got up one morning and the two fish were back in one tank - a gargantuan jump on the part of one fish. I didn't believe him then, I kind of do now. Jena: I don't think fish have souls but what in God's name do I know? :) I will remember him for doing as much good for me as I did for him and that's a fine Karmic compliment. Carol: I think think there'll be another fish in the near future, no. My relationship was finny (a typo but I think I'll leave it) in that I could go on a fishing trip and massacre many of his compatriots without a second thought but Lazz got the 4 star treatment up to the end and beyond. Strange. A very touching story with some twists of humor. It brought me to the time when I used to have a fish tank. Too bad, there was no place for the tank when we moved to a different house and left the it at my grand dad's house with a plecostomus inside. It died, the plecostomus,i.e..
What an amazing gift, this fish! Choosing to bow out on Friday the 13th on Birthday Eve is rather a grand finale; I'm proud of him. Her. Him. Goldie. Lazarus. You know who I mean. RIP, little fella. So what's Son getting for his birthday this year, that could top Goldie? and oh yeah-- HAPPY BIRTHDAY! What a delightful story. I'm glad I stopped by today. Take care, Ken. I must confess, we once had a goldfish named Freddy Krueger. I tried giving him hot baths and still he lived on. When the time finally came to flush him into the ecosystem, I was not sure he wouldn't return one night while I was sleeping to get even. My sons loved him, mom, prefers her fish with rice. My condolences. I'm glad Lazarus/Goldie was able to bring peace into your life before he left for the bridge. Nice post...I was so sure you were going to tell me the neighbor's cat got him, but then that would be another story! Margaret: That's what he brought, a little piece. I've found I resent being asked to take care of things, then I come to love doing it. Odd. Now you made me feel bad and people like PETA will no doubt be barging through my door with sticks and stones, tar and feathers. We kept a big fish tank in the basement in the house where I grew up. (West Rouge, east end of Toronto, should you have a map fetish). There were assorted guppies, swordfish, zebra and angelfish. Cleaner types and black mollies and of course goldfish. We had a lid but as the goldfish grew they heaved the lid off the tank along with their bodies. We never gave them a chance to Lazarus themselves. They all went down, down to the deep blue... errr... toilet in the sea. These days we have goldfish in the pond outside. Have yet to see them survive the winter though the pond is supposed to be deep enough. I don't mind. They are great, cheap compost for the garden each Spring. They eat bugs and mosquitos eggs/ larva all Summer and the frogs that visit seem to like them too. I don't name any of them. I did with one, the only white one. But he (notice that it is always he when something stupid comes up, :P) let himself get sucked into the water pump. He was much whiter then. Pretty dead too, no Lazarus there. Pretty neat that Goldie had offspring. None of ours did that. Likely too stupid to stay in the tank long enough. I'm sorry to hear that Lazarus/Goldie has passed. The passing of any pet is always an emotional one, especially for the primary caregiver. There seems to be a lot of passing of people and things lately. I suppose it could have something to do with the coming of spring and the promise of new beginnings. I'm thinking it's time to call Guinness, don't you? Ha ha! When I went to get the link, Ken, I noticed you had commented and linked me back to your "Lazarus". Poetikat: We move in ever decreasing circles. I loved your Irish posts this week, well done. Watch out for the pleco with the goldfish. My experience is that the plec likes to slurp on the goldie's slime coat after midnight when things get sloooow around the tank. gemmak: Ah but when you peeled them off the bath were they really dead? That is the question. About a year or so ago we got a goldfish. I picked one with a little black mark on his lip that looked like a moustache and he was going to be called 'Charlie' but the black mark vanished after a week or so and he's just been 'Fishy' every day since. He recently became too big for his bowl and so he's been relocated to a proper tank beside the bird's cage. 'Birdy' is pretending to be totally indifferent to the new arrival but every now and then I catch him peeking at me as I feed his neighbour. The bowl on my desk has now been taken over by a collection of snails, 'The Sluggies' who are surprisingly beautiful creature I have to admit and I spend far more time watching them than I ever did 'Fishy'. In ony of my previous lives I had an Oscar called 'Oscar' who also outgrew his tank and we had to take him back to the pet shop. He used to jump out of the tank and grab the food straight out of my hand. One day of course in his enthusiasm to be fed he missed my hand completely and wound up on the hall carpet and a very surprised fish he was I can tell you. I liked the fish tank I had back then. I used to have a shark who lived in one of those wee castles pointing vertically up or down. Every now and then I'd pull out the castle from around him and he's go and do the same in a corner of the tank till I put it back. And he was a big fish too - he was the same height practically as the castle. The other fish I has in that tank which was unusual was 'Mars Bar' - he was a Chocolate Talking Catfish. He didn't actually talk but if you took him out of the tank he'd croak at you to put him back. Jim: Oh Jim, thanks for this. I would have really not believed the Chocolate Talking Catfish without the link. "He didn't actually talk but if you took him out of the tank he'd croak at you to put him back." We had a similar experience. We had a koi which, to our horror, ended up on the kitchen floor by accident when we were moving house. He survived and went on to live for years.